Hi I’m Lisa from Cosmetic Sanctuary and I am so excited to do a guest blog post for Princess Polish!! Zoya is definitely my first love when it comes to nail polish, when I started out as a new blogger Zoya was the very first company to send me samples to review (they sent their True and Fleck collection! ), not only that, they have amazing promos throughout the year! I chose to swatch Zoya Ginger. At the time that I bought Ginger, I had absolutely NO orange polish in my collection and I wanted to fix that! When I put it on, I fell in LOVE with it (and orange is NOT a color I usually love)! Zoya Ginger is a gorgeous fiery orange with amazing gold shimmer throughout. This is not a neon orange, but it is very vibrant! I really don’t think Ginger gets enough love, I hadn’t even heard of it until I went into Zoya’s orange selection on their website looking to fill that gap in my polish collection! A big thank you to my fellow blogger, Lisa, for writing up a post. I know orange is so "on-trend" right now and with Zoya Arizona being touted as one of the hotter shades of the summer, Ginger is poised to make a surge. Ginger is available at Zoya.com for $8 and may also be available at your local Ulta, depending on your selection! While you should be sure to check out Day 28's post to vote for the final day of the 30 Days of Zoya Challenge, I still have to ask you one last question. 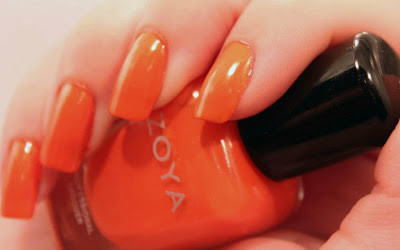 So tell me...what Zoya orange appeals to you most? Oranges don't look good on me, but I like Ginger! Tanzy, Gwin, and now Myrta are on my wish list! Oh yeah, and Tru for the grand finale! I have Rica but haven't tried it yet. I may get Myrta from the new collection though. It looks pretty. And I vote Lotus for the finale. I really want Paz! I voted Skylar for the finale!